Tim Winton Review: The Deep. Tim Winton Review: Alice is a young girl who lives near the sea. Though Alice has little fear of spiders and snakes, or even the dark, she is afraid of deep water. This poses a problem, because all of Alice's family love to swim in the deep water near the jetty. Alice would love to join her family in the deep water, but cannot overcome her fear of the water, which is described as the deep blue. Alice piggybacks on her father out into the deep and feels safe while she clings to his hair. But she is unable and unwilling to cast off into the deep water alone. This makes Alice quite miserable, because she knows that she is brave in so many areas of her life, and is tired of being frightened of the deep blue water. One morning Alice follows some dolphins out of the shallows, and, because she is having such a fine time, is soon swimming in the deep. Alice panics briefly, but she is surrounded by her family who encourage Alice that it is just water. Alice soon forgets her fear and begins to enjoy herself in the deep water. The Deep is a very enjoyable book which is suitable for younger readers, between grades 1-3. The story of Alice overcoming her fear of the unknown is something every young child can relate to. Most young children have a fear of something. For some it's fear of the dark, for others its fear of the water or fear of spiders, etc. Tim Winton uses strings of action verbs to propel the story forward. For instance, "Everyone sputtered and splashed and laughed" and later in the text, "Alice grunted and puffed and scrambled." Excerpts from The Deep, by Tim Winton. I tend to use The Deep as an introduction to figurative language for younger students. Tim Winton, as in his adult fiction, is a master at using simile and metaphor to add sparkle to his stories. Simile is used to great effect to describe familiar scenes that younger readers will recognize. For instance, "Sometimes, Alice let her dad piggyback her out of the shallows and into the deep. He was like a big old horse swimming under her..." Excerpt from The Deep, by Tim Winton. Many young children will have had the experience of riding a horse, and may conclude that it's kind of similar to riding piggyback on their father's back. Tim Winton uses similar imagery throughout the story that younger readers will relate to and understand intuitively. 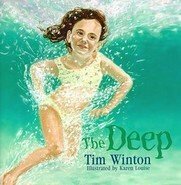 Tim Winton's The Deep is recommended for readers between the ages of 6-9 years of age. It is an excellent shared reading text that features many beautiful passages of written language. The Deep, by Tim Winton, Illustrated by Karen Louise. ISBN-13: 9781863682107 This book is published by Penguin Books.